alaTest ha raccolto ed analizzato 66 recensioni su Babyliss 7447GU. La media della valutazione per questo prodotto è 4.4/5, confrontata con la media della valutazione di 4.3/5 per altri prodotti. Abbiamo analizzato differenti valutazioni di esperti ed utenti, età del prodotto ed altri elementi. A confronto con altri prodotti, Babyliss 7447GU ha ottenuto un alaScore™ complessivo di 87/100 = qualità Molto buono.
" Brought this for my husband for Xmas. Really pleased with the quality of the cut. Item is nicely presented in a hold all. " 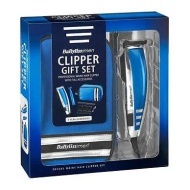 BaByliss for Men 7447GU Hair Clipper Set.
" This was a present and was well received. " " Brilliant item. Easy to use. All in all a great cut. " " Christmas gift for my son who is delighted with it. Apparently it is very smooth and quite powerful. Liked the attachments as well. " " Would definatly recommend these very easy to use and comes with extras very worth every penny. " " This product was bought as gift, it was very well received "
" What bargain, what a system, brought online 11.00pm at night, visit shop 8.30am next morning haircut and styled half an hour later all thanks to fast tracking "
" Purchased this for my son in law for Christmas and he said he was highly delighted because it contained everything he needed . " " this product is really good, cut's the hair perfect. " " Excellent product and excellent service from Argos "